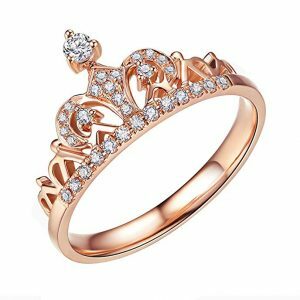 Best Rose Gold Princess Rings Deserving of Your Attention! The colour of rose gold rings vary, and ranges from a deep, almost copper-red colour to a light, blush pink lustre. The color variation depends on the recipe of the rose gold alloy. 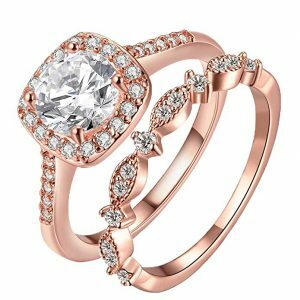 The light pink rose gold rings is made from mixing yellow gold with silver or zinc, and a lower amount of copper, while the dark shaded rose gold rings on the other hand, contain higher percentages of copper content. You should however know that the colour variation of the gold does not in any way suggest that its value will diminish overtime. It simply gives the gold a rigid shape and a unique glow. The copper may darken slightly with age, making the pink lustre appear a little redder than when you bought it, but you should note that Rose gold rings do not chip or tarnish. This is a natural feature. The darkening of the copper is even considered desirable, because it gives rose gold rings an exquisite vintage look. The highest karat of rose gold is known as crown gold, which is the 22k rose gold. Crown gold is a mix of 91.667% gold by weight, alloyed with copper. 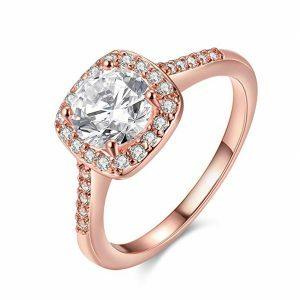 The type of rose gold that results from the mixture of this high karat cannot sufficiently create long lasting rose gold rings. Without an adequate mixture of copper with pure gold, rose gold rings cannot be created. 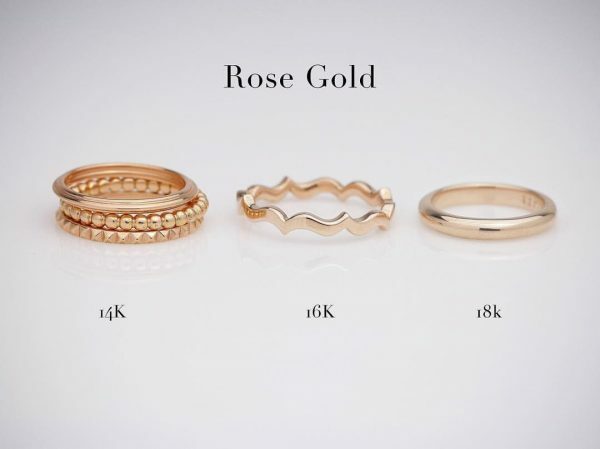 Other types of gold karats for rose gold rings include 18k, 14k, 10k and 9k rose gold. The highest rose gold karats that can be used to create men and women rose gold wedding bands or engagement rings is the 18k rose gold. This type of rose gold alloy includes 75% yellow gold by weight, alongside varying amounts of copper and sometimes silver and andc. But, the mixture can be adjusted to produce different colours. For instance, the usual and most frequently used quantity for an 18k rose gold includes 18 parts of pure gold and 6 parts of alloy. The 6 parts of alloy could be manoeuvred to 3 parts of copper, 2 parts of silver and 1 part of zinc or 2 parts of copper, 3 parts of silver and 1 part of zinc or no parts of zinc in the alloy at all. Dazzlingrock collection is a mind blowing jewelry store with several varieties of jewelry options that suits several persons and tastes. Making the right choice to impress your loved ones can be made easy, regardless of the fact that you are in search of something exceptional or sophisticated. This elegant diamond engagement or bridal ring, features perfectly cut stones and designs that will suit your preferences and budgets. It is the most splendid gift to give for your anniversary and a more soulful representation of a timeless bond of love and affection that connects two people. The ring features 0.18ct princess cut and 0.32ct round cut white diamonds in pong setting. It has a package dimension of 2.5×2 inches and it weighs about 2.50grams. 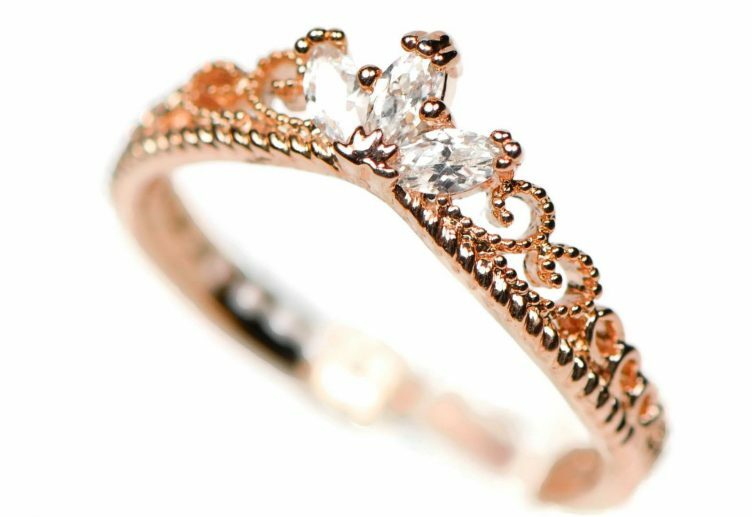 This rose gold princess ring is also universal. It was designed to fit just about anyone who is interested in the design style. The ring size comes available in a spectrum of finger sizes ranging from size 4 to size 10. 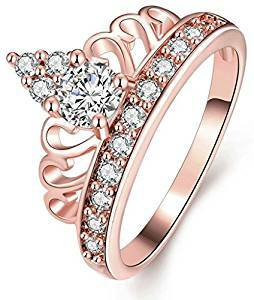 The Anazoz jewelry store’s Rose gold tiara ring, accents many clear cubic zirconia and one pear cut solitaire zirconia, with the embellishment of these stones, the ring gives off sparkles like real diamonds and reflects rainbow gloss under sunshine. It is classy and designed uniquely to suit your feminine-fine modern look every day. It is durable, made of high quality metal materials and has the smooth surface that adds a touch of elegance and dexterity, enough to make you stand out in the crowd, like the princess that you are. It will make an adorable gift to give your children as a parent, showing how much you love them. This ring can also be a magnificent wedding gift to remind your partner how much she means to you, and her place in your heart. It is made for every woman, accentuating comfort, class and style. It comes in different sizes ranging from size 5 to size 9. This Sainthero women’s crown Tiara rings is an aesthetically appealing piece. It perfectly fits as a wedding or engagement ring set. It has gained much popularity among couples and is an excellent, multifunctional possession for women with great love for antiques and classic style in jewellery. It is of high polished finish, it has a comfort fit and varies in sizes from size 6-10 finger sizes. These qualities make it comfortable to wear for any occasion, and serves as an excellent anniversary ring for any woman. The nature-friendly brass-base is 5-time 18k gold plated and each cubic zirconia (CZ). Is skilfully set. 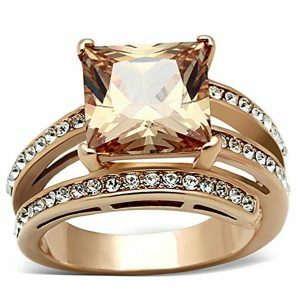 The Triple Strong and powerful princess cut pink cubic zirconia diamond ring sets are perfect wedding bands to symbolize your love. Celebrate your undying love for your woman with this exquisite AAA Clear Cubic Zirconia gold plated ring. Each piece of this zircons has been carefully selected to ensure it gives a shimmering appearance of the jewellery on the wearer. The ring features a big square simulated diamond, surrounded with plenty of round glittering stones that display enriched clarity just like real diamond. It is made from metal and crystal, varying in sizes 6, 7, 8 and 9; with the dimensions of 2.1×2.1×1.2 inches. It just weighs 0.64 ounces, and it comes with a lovely bracelet and gift box. 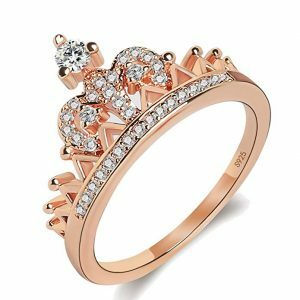 This lovely jewelled rose gold princess ring is astoundingly unique. It possesses the radiance and absolute brilliance of the cubic zirconia stones, that is can be equalled to those of diamonds to the untrained eye. It is lead-free, and is produced with the rose-gold-plated-base metal as its material. This product is polished in 360 degree with a smooth and flawless surface. It is extremely suitable for different occasions including anniversaries, birthdays, prom and even cocktail parties. It can be purchased in different ring sizes, ranging from size 5-10. At Tivani, You can always find a special gift for a loved one or a beautiful piece that complements your personal taste. The Tivani eternity love ring is a timeless piece. 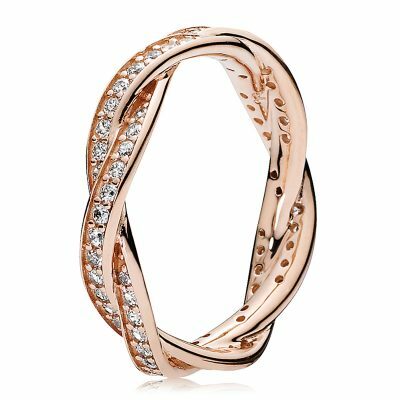 The rose gold princess ring is long lasting. With its 18k rose gold plate and pretty AAA+ CZ crystal, you don’t have to worry about it’s durability or not making your loved one happy. This ring is definitely worth the purchase, and they vary in size too, ranging from size 5 to 10. The ring is a perfect pick for every jewelry lover, it fits every look for every occasion. The Marimor cocktail ring is an exquisite piece, a must have for every lady. It is crafted and carved with much dexterity and creativity, its unique design is irresistible and therefore endears it to jewellery lovers, if you are a lover of precious stones, this gold princess cocktail ring should be your next jewellery feat, it is the ideal ring to add matchless value to your jewellery collection. The stunning cocktail ring will enhance your grandeur multifold, and your fashion quotient alike. This chic rose gold, ion plated 6.85ct AAA grade champagne is amazing. The ring is second to none in quality, beauty and longevity. It is made from stainless steel 316 and has a Rose Gold Ion Plating (high polished) finishing. The ring is designed for universal fit. It is crafted in sizes ranging from ring size 5 to size 10 and has a width of 13mm at widest point. It comes in two colours, available for grabs; the champagne and clear colour. 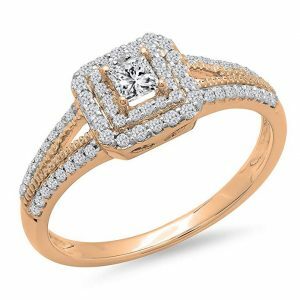 It has a princess cut shape and a prong or pave setting depending on your choice. The gemstone is AAA Grade Cubic Zirconia and has a centre stone carat weight of 5.62ct, while the total carat weight is 6.85g. The ring could be worn to any event and can as well be used as an everyday wear. Did I mention that it is a perfect fit for wedding and engagement rings? Treat yourself extravagantly to this embellished fashion jewellery ring and make heads turn at your exotic invaluable accessory. 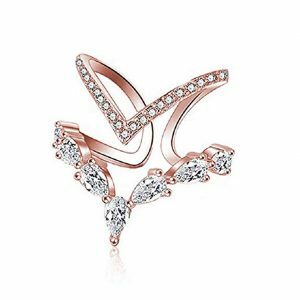 This flawless rose gold plated and cubic zirconia ring will match any fashionable look, and make you sparkle, giving you the best of both worlds-the glamour of a princess and the regal splendour of a queen. This high-quality piece will be the perfect gift to your wife, mother, girlfriend, best friend, daughter or even to yourself. It comes packed in an elegant jewellery box, making gifting as easy and spontaneous as possible. It is a must-have princess cut ring to brighten up any special person in your life, and show off your stylish taste in the most elegant way. It comes in all finger sizes, ranging from sizes 5 to finger size 9. 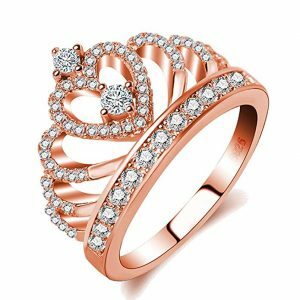 The Kavani sterling rose gold princess ring is an excellent choice, created only for queens. It is designed in three colours; the white gold, yellow gold and then rose gold colour. It is the most appealing handmade ring you’ll find. It has a unique design that is simple enough for an everyday piece and yet, classic enough to make statements everytime it is used. It depicts a simple yet fashionable woman, one who is fierce and yet tender. It is accented as a V-shaped design with many, tiny rhombic cut cubic zirconia. Its timeless design flatters any style without overpowering it, because beauty is simplicity. It can be worn alone or worn alongside other rings. It possesses dimensions of 2.9 x 2.8 x 1.7 inches and a weight of just 0.8 ounces. This highly polished ring is nickel-free, lead-free and hypoallergenic. The plating is excellent enough to guarantee a long lasting brilliant finish. The shiny cubic zircon are each, well-crafted and is not such to easily fall off the ring, the zirconia sparkles like real diamonds and they reflect rainbow glosses when under sun rays. It is easy to wear, it comfortably fits every finger size. It is created in varying sizes of 6-9. And not to worry, it is tarnish-free and it won’t leave any marks on your fingers. It will make a lovely gifting option, wrapped in its own beautiful round gift box. Presentski jewelry store is renowned for its high quality fashion jewelries. These jewelries come in all shades of classic and charming designs and are so on the high among women and even gentlemen. The Presentski ring is a fashionable 925 sterling silver crown princess diamond ring, plated with the colour of rose red golden. It is sized 9 and the ring always comes packed in a beautiful jewelry pouch, ready to be gifted out. It is a perfect gift for your lover on a special day like Valentine’s Day. The ring is suitable for any occasion or look, it’s a perfect every day wear too. It is beautiful and grants a queenly look to any finger that wears it. It really cannot go unnoticed. The ring has a package dimension of 5.7 x 3.7 x 0.5 inches and it weighs 0.64 ounces. There are two simple process to clean your rose gold jewellery at home. They do not require too much of your time, and it is pretty easy to use whichever one you decide to go for. The first option is to clean your rings in warm water with a mild dish soap, with a soft brush and the other option will be to line a bowl with aluminium foil, shiny side up. Then in a separate bowl, microwave one cup of water for 1-2 minutes. In the aluminium foil-lined bowl, combine the warm water, one tablespoon each of salt, baking soda and dish soap. Soak your rose gold jewellery in the water mixture for 5-10 minutes, remove and then dry it thoroughly with a free-lint cloth but be careful not to snag the fabric on the prongs or the settings, if it has any. And viola, your ring is good to go. ✓ Avoid contacting acid and alkali, corrosive substances and chemicals from body sprays or colognes, bathing soaps or just about any chemical, even body discharge like sweats.